Watch a NASA Rocket Create Colorful Artificial Clouds Over US East Coast Tonight! 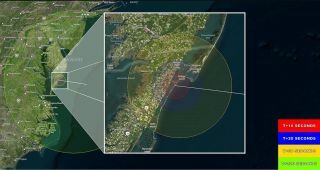 Artificial clouds should be visible shortly after 9 p.m. EDT on June 11 from New York to North Carolina if a NASA sounding rocket launches on time from the agency's Wallops Flight Facility in Virginia. Update for June 15: NASA's next attempt to launch a small sounding rocket to create glowing clouds in the night sky will occur no earlier than Saturday night (June 17). Liftoff from NASA's Wallops Flight Facility from Wallops Island, Virginia is scheduled for some time between 9:05 p.m. EDT and 9:20 p.m. EDT (0105-0120 GMT). Original story: A small NASA rocket will launch to create colorful artificial clouds on Sunday night (June 11), and you can watch all the action live. Weather permitting, the launch could be visible to spectators on the U.S. East Coast from New York to North Carolina, NASA officials said. The two-stage Terrier-Improved Malemute sounding rocket is scheduled to lift off from NASA's Wallops Flight Facility in Virginia between 9:04 p.m. and 9:19 p.m. EDT Sunday (0104 to 0119 GMT on Monday, June 12). You can watch it live here on Space.com, courtesy of NASA; coverage begins at 8:30 p.m. EDT (0030 GMT on Monday). You can also follow the flight on the Wallops Ustream site: http://www.ustream.tv/channel/nasa-tv-wallops. The ampoule doors on the sounding rocket payload are open during testing at NASA's Wallops Flight Facility in Virginia. The Terrier-Improved Malemute rocket is scheduled to launch at 9:04 p.m. EDT on June 11, 2017.